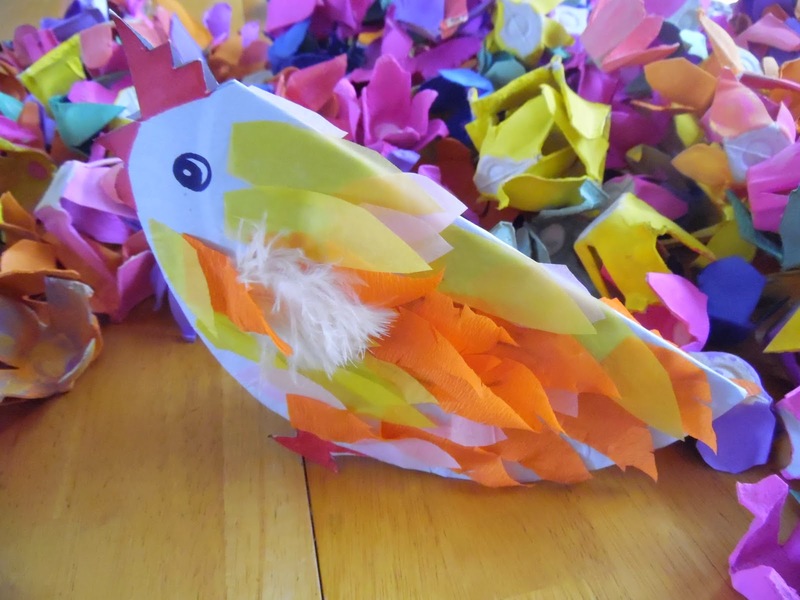 easter Craft | Let their light shine! 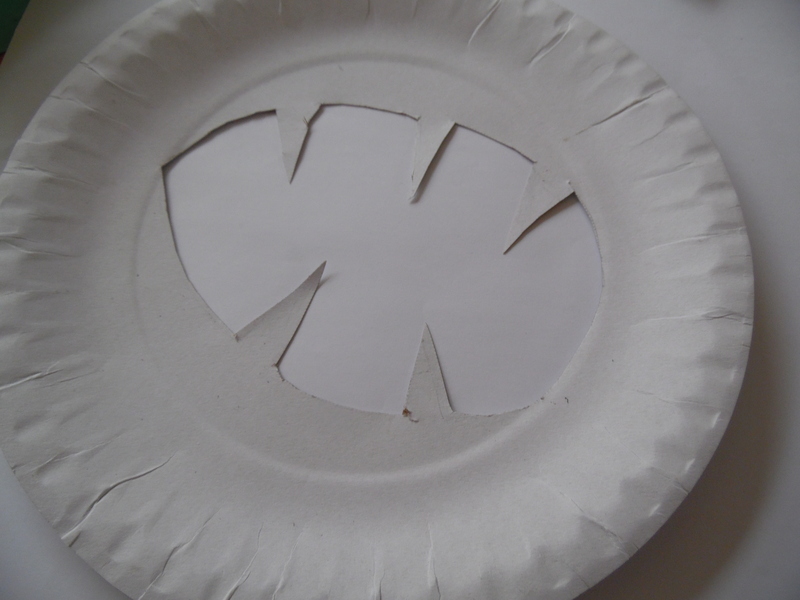 Sometimes I have cut out wreath shapes from paper plates but when you need to make 50 that can take a while! 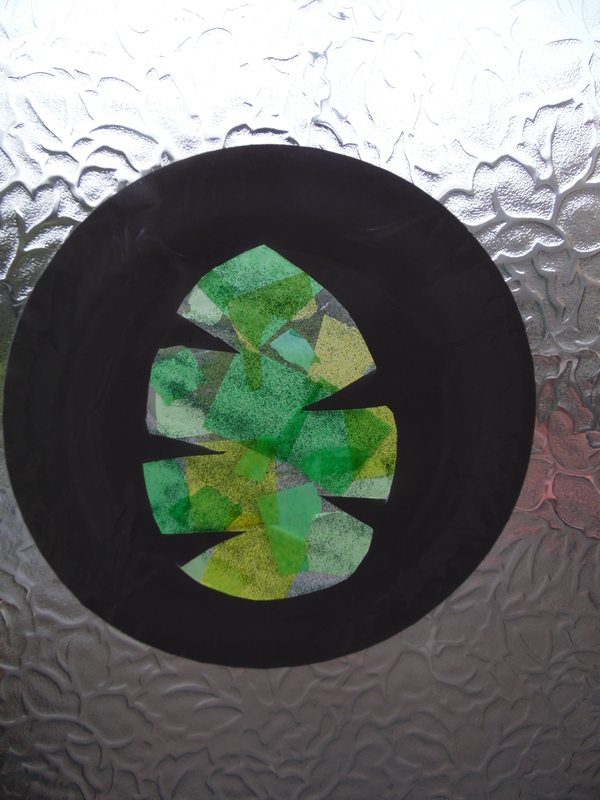 So when I found that Baker Ross were selling cardboard wreath shapes I was really keen to try them out. As you can see they are dark brown, obviously made of card and come with a hole and some string so they can be displayed at home. A big win! Here’s the link to Baker Ross with all the info about the craft wreaths. The embellishments are from Hobbycraft (eggs and bunnies) Take the eggs out of the packaging well ahead as they really do smell! 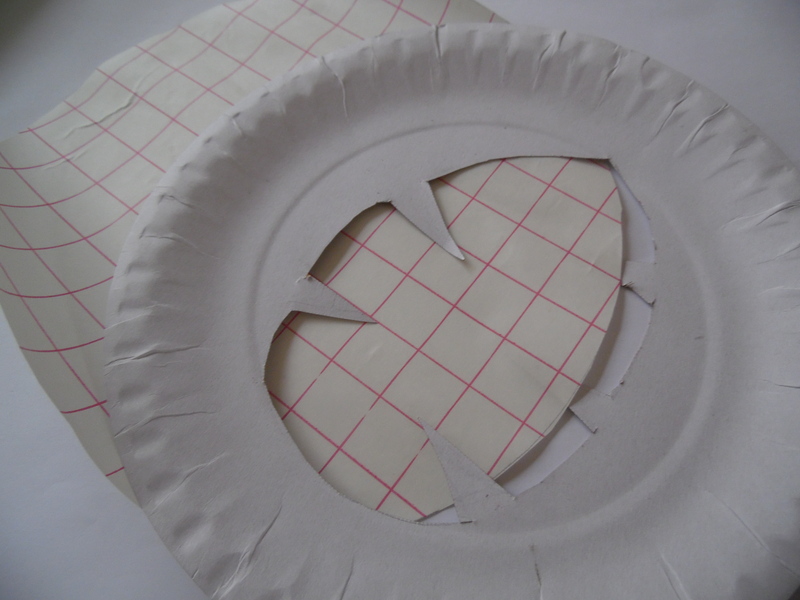 The paper hearts and circles are made with a paper punch and the confetti is the biodegradable kind. I cut the bird and ladybird from molliemakes magazine. The Easter greeting is on sugar paper and I did write happy Easter 50 times. Part way through I began to worry that I was spelling Easter incorrectly! I will definitely be using the craft wreaths for other crafts. Really great find. 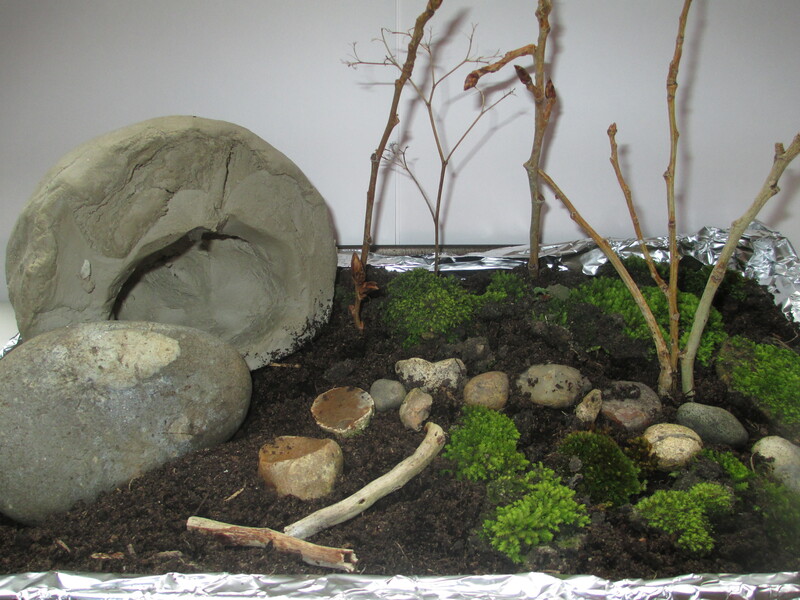 A simple Easter garden is a great way to introduce young children to Easter. You can use natural materials such as soil/compost and leaves or you can make a garden like the one here. The playdough will last a couple of weeks before it dries out – so this won’t keep for ever – but then next Easter the children can make another garden. 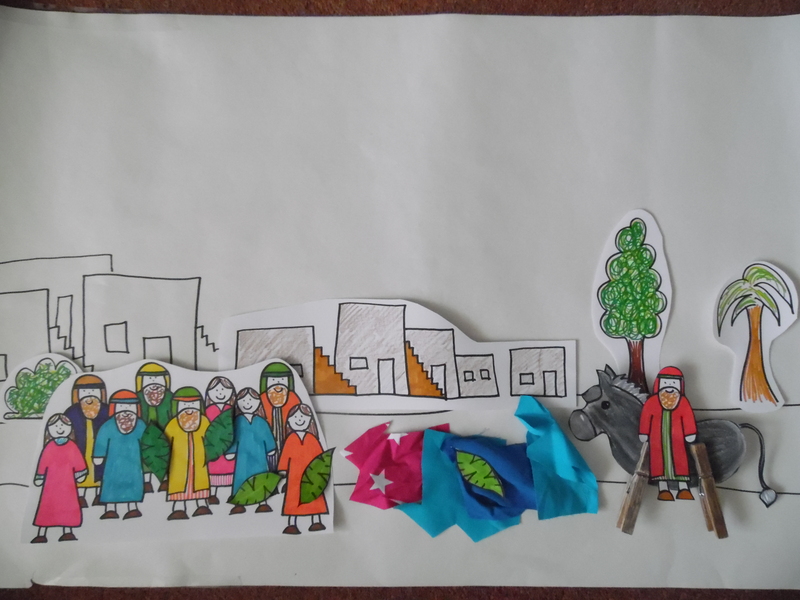 At the end of this post there is an idea for telling the Easter story using different faces – there is a PDF for you to use too. more playdough needed – the Weetabix is pressed down into the dough. Make a garden to give children and adults an idea of what they are aiming for. If you click on the links above you will be taken to where I bught the plates, ice cream tubs and flowers. You could use different plates – just make sure they are the shiny coated type so the dough won’t soak through. To prepare the craft cut a ‘stone’ out of ice cream tub and make the dough. You will need a lot of dough! Put everything in a large saucepan and mix over a medium heat till it comes together as a dough. Take out of the pan and kneed on a lightly floured surface for a of minutes till smooth. It will be hot! Store in an airtight container/bag in the fridge till you need it. Let it come to room temperature before the children use it. This amount will make 5 square plate Easter Gardens if you cover the entire plate. You could cover less of the plate as in the picture above. To give you an idea of how everything gets put together..
Have a look at an Easter garden I made to show the children at Toddler Group during story time. Jesus is still alive today! Show the happy face and ask, ‘can you look happy?’ We can be happy because Jesus is alive! I found this via Pinterest – it’s originally from this website http://krokotak.com/ which is full of absolutely great ideas. 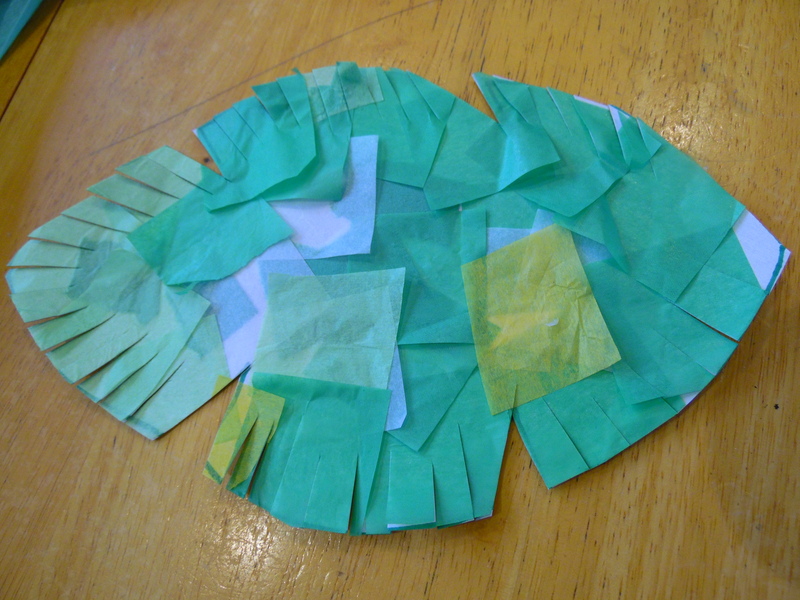 The idea for my simple chicken came from here http://krokotak.com/2012/11/cut-away-some-paper-animals/. 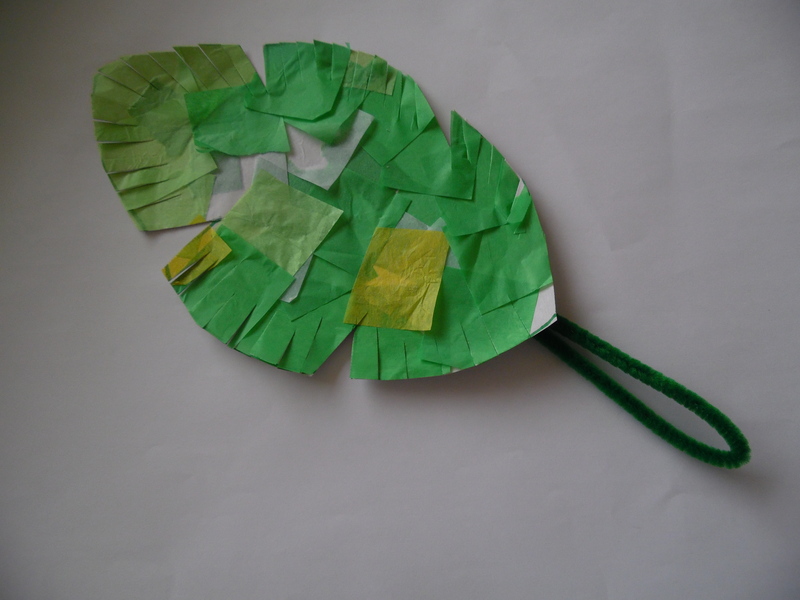 My version is a bit simpler as I was cutting out quite a few for our toddler group. If you wanted to you could place these on the breakfast table on Easter morning and hide a chocolate egg underneath! 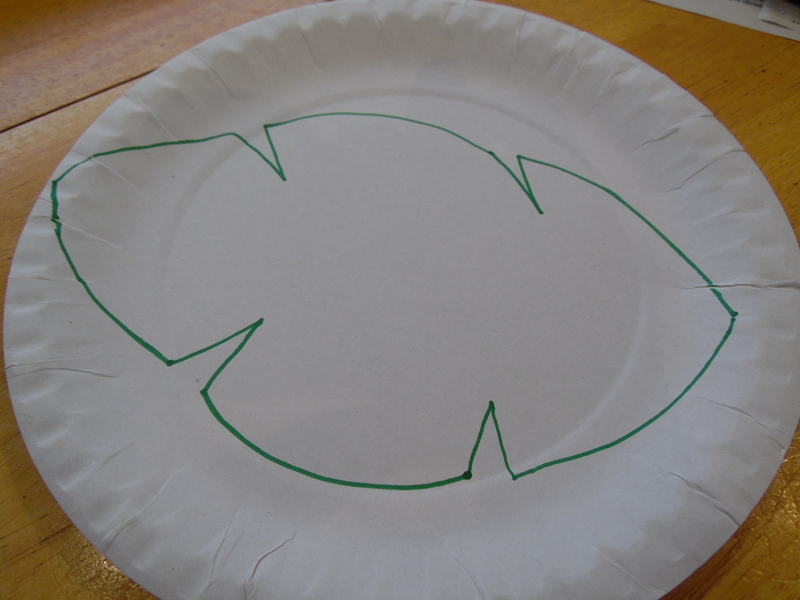 Chicken+Plate – PDF file with simple template. 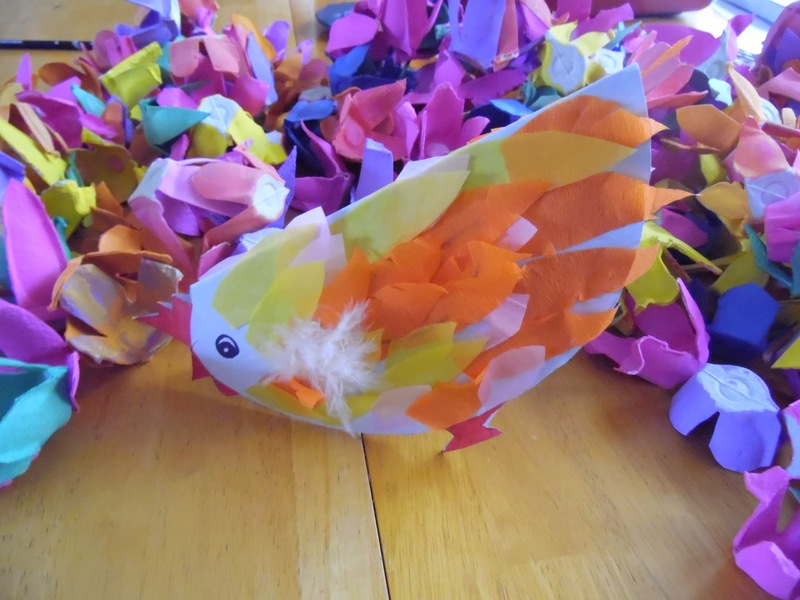 We decorated the chicks with feathers and tissue and crepe paper. To make these pictures I started with a roll of paper from Ikea and drew a road. The buildings and trees were added. As you tell the story you can add all the things you need. 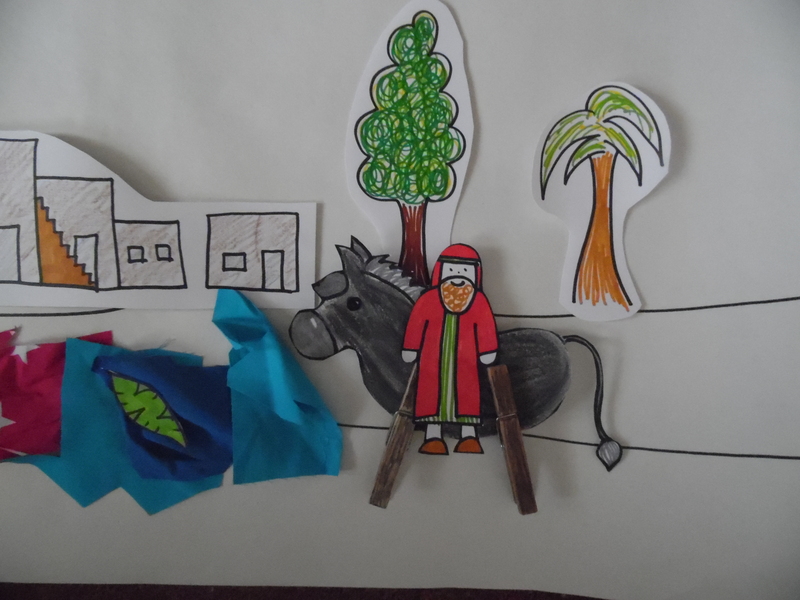 The cloaks were cut from material, the donkey has pegs for legs. The people were copied from this book Their God is so Big by Stephanie Carmichael. It’s on offer at the moment! The donkey with pegs for legs would make a good craft. help yourself to the free printables. This year Palm Sunday is 29 March. The story is from Luke 19, Mark 11, John 12 and Matthew 21. It is the beginning of the end of Jesus’ life on the earth. In Mark’s gospel we read that ‘they (Jesus and his disciples and followers) were on the road, going up to Jerusalem, and Jesus was walking ahead of them. And they were amazed, and those who foloowed were afraid. And taking the twelve again, he began to tell them what was going to happen to him saying, ‘See, we are going to Jerusalem, and the Son of Man will be delivered over to the chief priestsand the scribes, and they will condemn him to death and deliver him over to the Gentiles. And they will mock him and spit on him, and flog him and kill him. And after three days he will rise.’ Mark 10:32-34. These must have been difficult things for Jesus to talk about. The disciples don’t appear to have really understood – James and John are bothered about where they will get to sit in heaven! But despite the fact that Jesus knows he is going to Jerusalem to die he stops to help a man who is calling out to him. Bartimaeus is sitting by the roadside and shouting out for help. And Jesus stops and helps. And then the group arrive at the outskirts of Jerusalem and Jesus sends two disciples to fetch a donkey. He rides into Jerusalem at a time when the place would have been packed with people there to celebrate Passover. 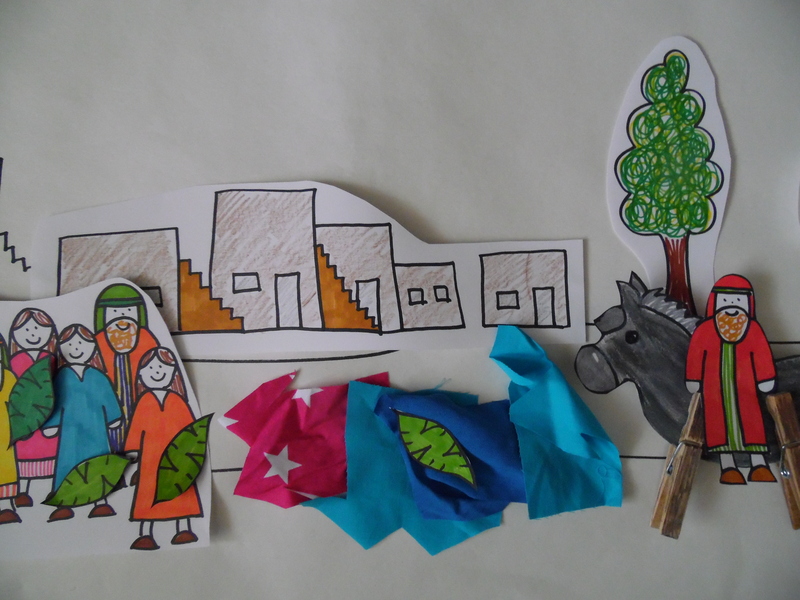 They welcome him – laying clothes on the floor and waving palm branches calling Hosanna. 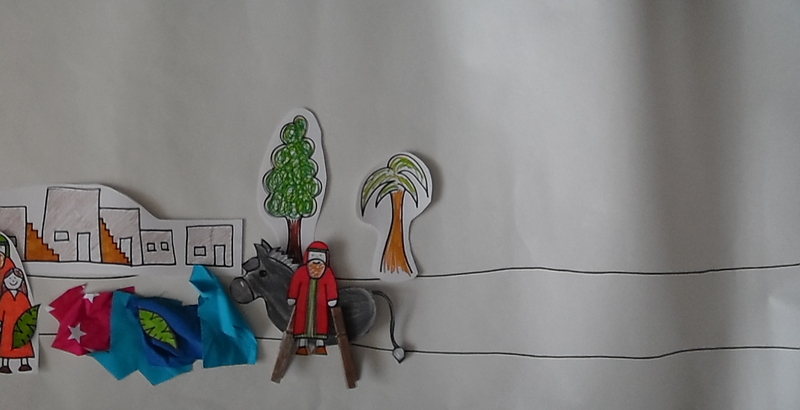 For young children it would be good to ask them to shout ‘Hosanna’ at the right time in the story and wave palm branches that they have made. 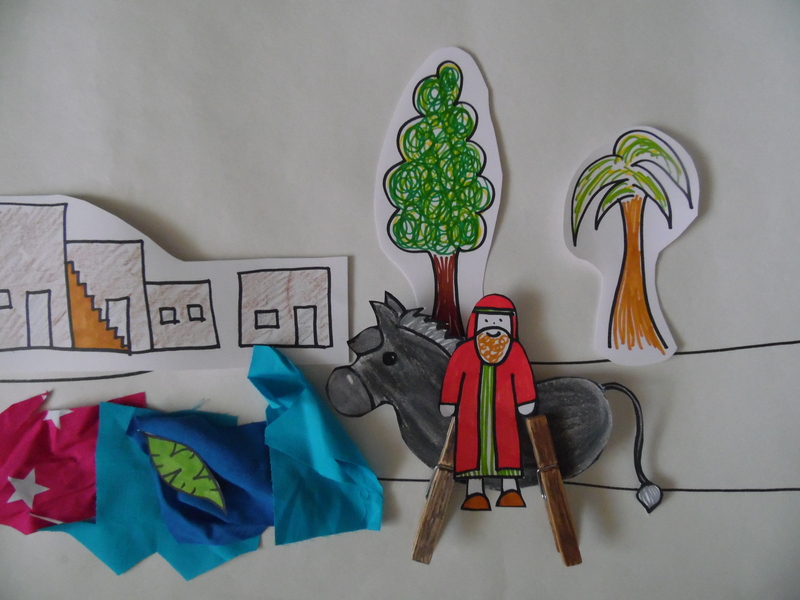 If you use a story bag include a toy/model donkey, a cloak to lay on the floor and a palm branch. For older children make the connection with Old Testament prophecy as highlighted in Matthew’s account. It’s also useful for older children to have a timeline of the Easter events. 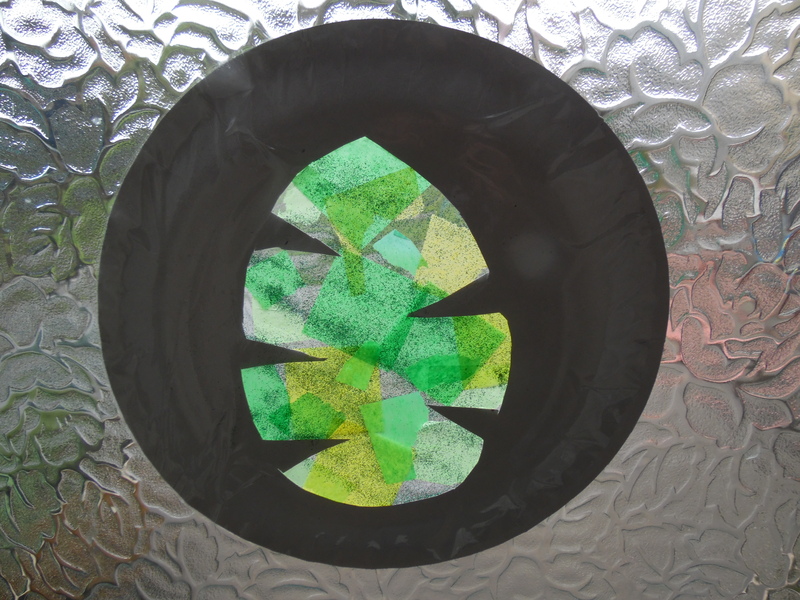 A couple of palm leaf crafts – a suncatcher and a collage. Both use paper plates. The sun catcher is a little more tricky and has tacky back and glitter! 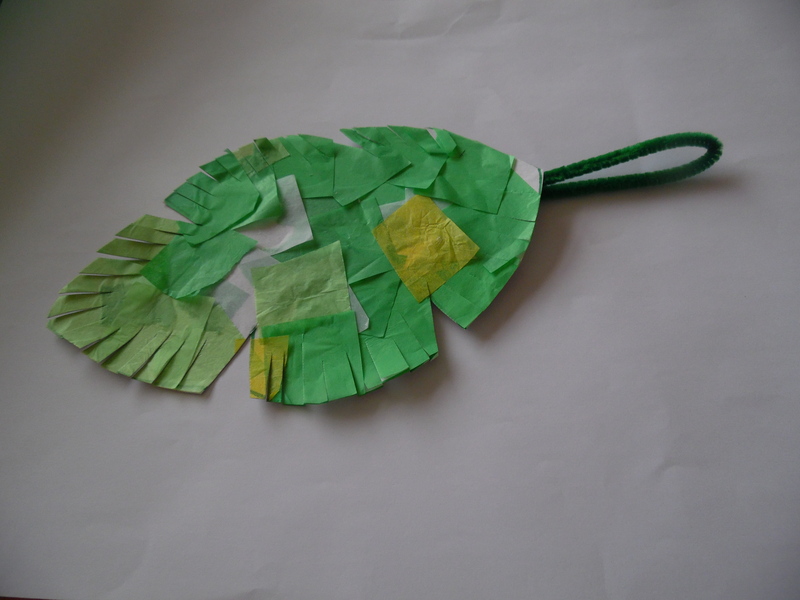 The palm leaf collage can be cut out and a pipe cleaner attached so it can be waved during the story. 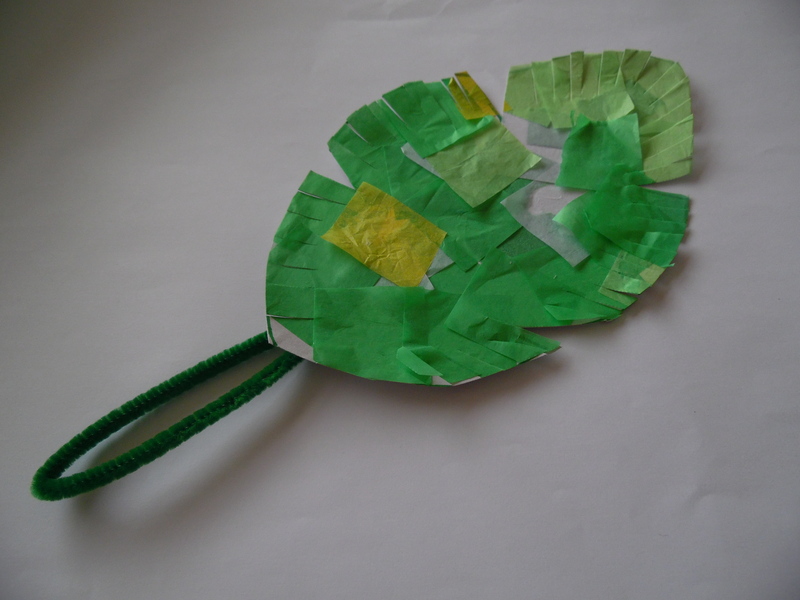 Older children could design a sun catcher and cut out the shape and attach the tacky back etc. 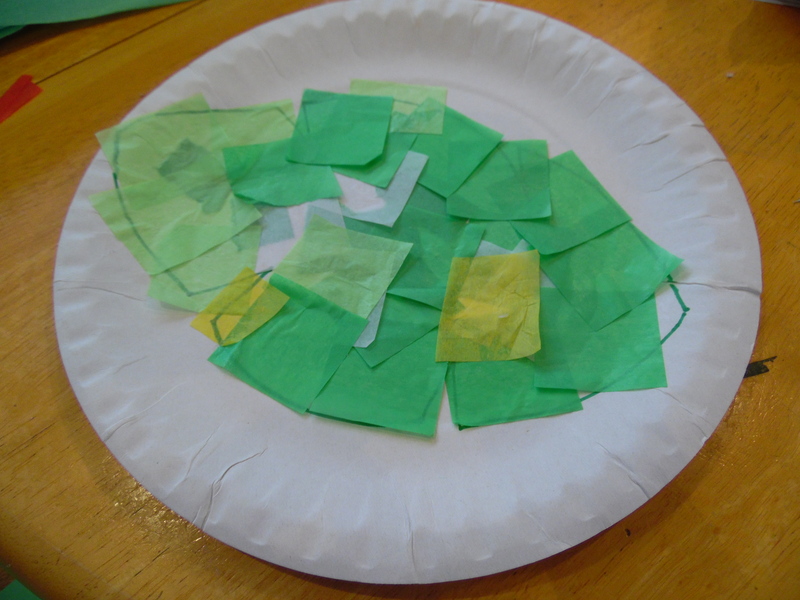 We made an Easter Garden for our Toddler Group Story Time. A very simple but effective visual aid. Older children could make their own. Air drying clay rolled into balls to stick the twigs into to secure them. Cover the balls of clay with compost. This would be a great activity to do during the Easter holiday. You could have a competition to see who puts the most effort into making their garden. 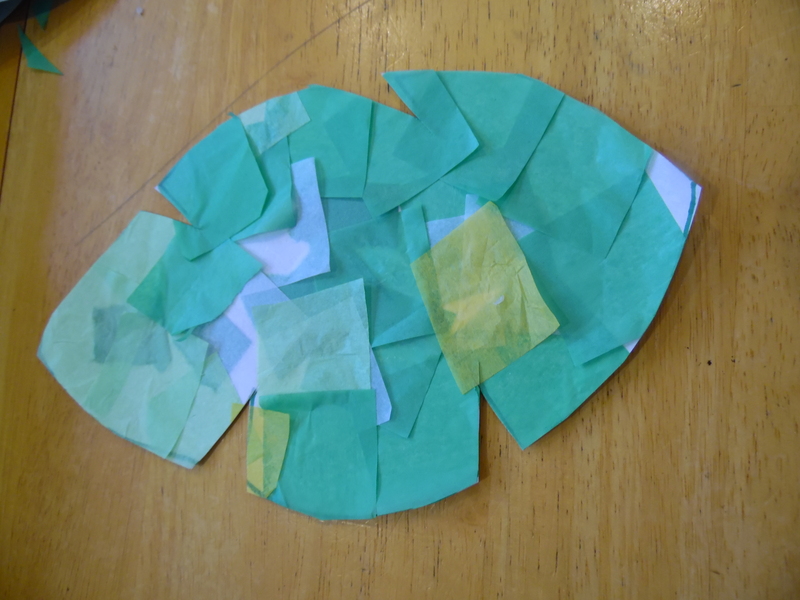 Children of almost any age can decorate these simple egg shapes. We used them at toddler group today, but they would be great for older children who would be able to do more intricate designs or pictures. To make them you need to start with a salt dough. This is very easy. You need 2 cups plain flour, I cup of salt and I cup of water (add this gradually as you may not need it all). Kneed the dough on a floured surface and roll out to about 4mm thick. As you do this keep making sure it isn’t sticking to the work top. I used a template and cut around it. You could also use an egg shaped biscuit cutter. If you are making hanging decorations you need to make a hole for the thread about 1cm away from the edge. Then leave the shapes to dry. They will air dry, but it will take a long time (48 hours plus) or put them in a low oven, not more than 100C, for up to 4 hours. (they can burn so keep an eye on them). Once dry you can paint them or leave them plain for children to decorate. We used felt tips to decorate but you could also glue coloured paper on to them and add glitter! 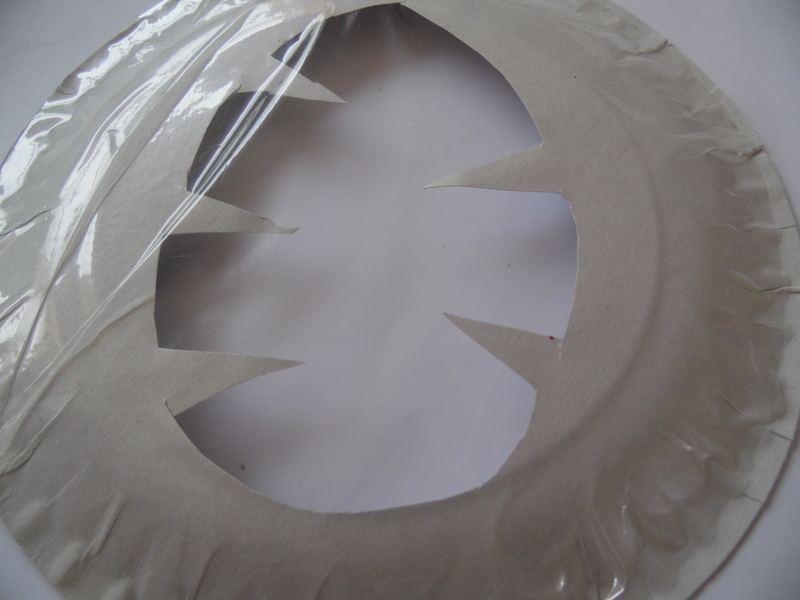 A covering of PVA glue at the end will add a shine – but as you can see in the pictures the colours may run a bit. 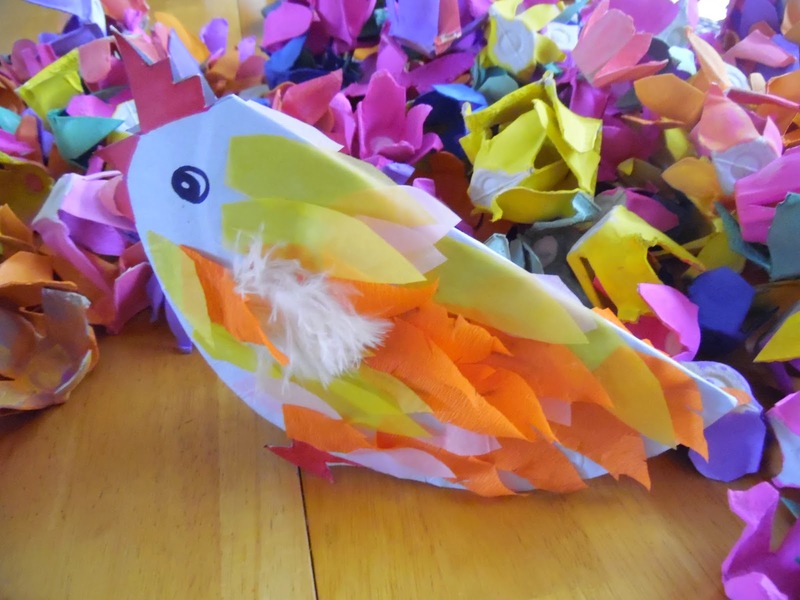 I loved this craft and my children had a really good time using up the left over eggs. Our Easter Story in toddler group focused on people seeing Jesus alive again. We reviewed what we had learnt about our eyes first and then the story was told about Jesus dying but coming back to life again. At the end of the morning every child received a chocolate egg in a stripey bag. Yum!